Mooga dali usli is a healthy and tasty snack prepared by Konkani people. While talking with HD about the plan to incorporate dals in my everyday cooking, pat came his suggestion "Mooga dali usli". Outwardly I was smiling (and my eyes rolled up) but inwardly I was thinking how will I prepare it? 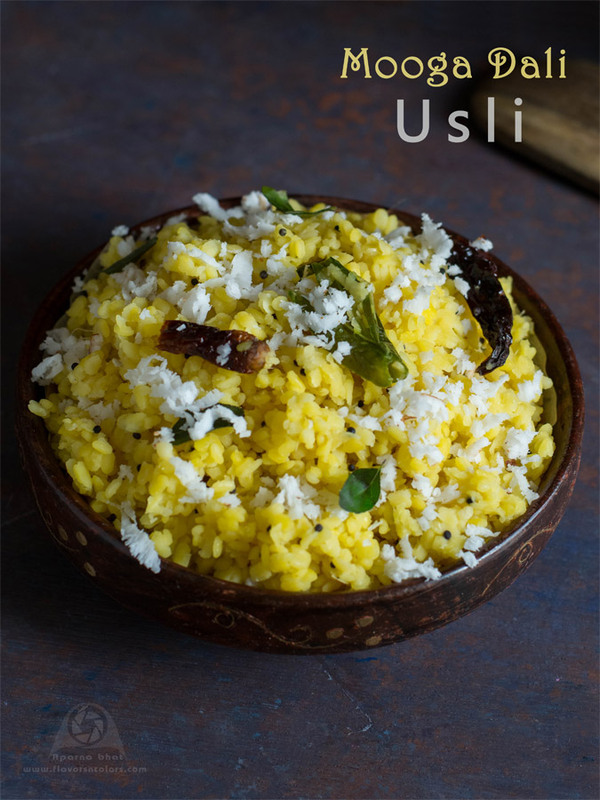 Though the recipe is simple, easy and nutritious but the key step for a tasty usli lies in cooking moong dal perfectly - neither overcooked nor undercooked. And this step which I failed to achieve during my initial days of experimental cooking had discouraged me. I had not prepared it for long time after those failed attempts. So after a lot of trepidation, I decided to include the dish in my meal planning and prepare it regularly. Glad I did so because with each attempt I managed to master the step of cooking the dal perfectly! Wash, rinse and soak yellow moongdal in sufficient water. Drain the water and keep the soaked moong dal aside. In a vessel heat water [enough to cover the dal]. Let the water come to a rolling boil. Now add soaked moong dal and cook until soft but not mushy. (When the moong dal is half cooked I add little salt just to avoid dal getting overcooked). Once done switch off the flame and strain excess water if any. Heat coconut oil in another pan. Add mustard seeds. Let it crackle and then add broken red chilies, chopped green chilies, curry leaves, hing. Stir it for few seconds. Add grated ginger and cooked dal. Add salt to taste [if required because you have added salt while boiling the dal] and sprinkle some sugar. Mix it well. Now add fresh grated coconut. Give a stir and cook it for a minute on low flame. Usli is ready. Garnish with fresh grated coconut and serve it warm.